Seatbelt Adjuster - Comfort at last! The Seatbelt Adjuster clips onto the waist area of your seat belt instantly, and spares you hours of discomfort on the road. Designed to slide approx. 3 to 5 inches on the seat belt waist area, it holds the shoulder strap away from your neck and chest area with no loss of safety. Wonderful on long trips! Motivates people to use the seatbelt properly. 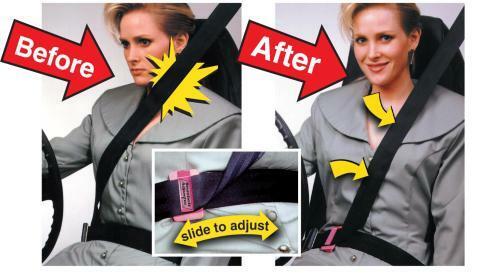 The Seatbelt Adjuster can remain fastened to the lap belt permanently once attached. Fig. 1: Attach the Seatbelt Adjuster to the lap part of the belt by centering the belt between the hinged tongue and the front part of the clasp. Fig. 2: Snap the back tongue securely in place by pressing the two pieces together until you hear a sharp clicking sound. Fig. 3: Slip the shoulder belt under the front tongue of the Seatbelt Adjuster and slide the Adjuster to a comfortable position until the shoulder strap is away from your neck. Note Do not slide the Seatbelt Adjuster more than 3" to 5" away from the buckle clasp. 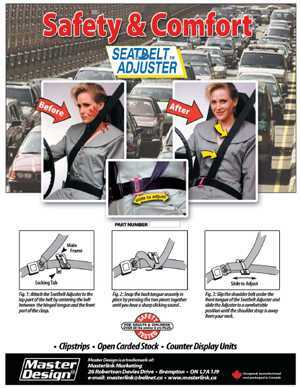 You can find the seatbelt adjuster in your local department store or automotive outlet. Click here to find out which stores and retail chains carry our products. If you are a retail store owner looking for new products, this site includes information on merchandising our products including full color ads, brochures and display details. The Seatbelt Adjuster is a great promotional product and can be used for recognition, fundraising and to raise awareness of safety issues. Margie Speck of Muskegon said she loves her Seatbelt Adjuster. Speck only had to slide the adjuster 3 to 5 inches from the buckle clasp, thus re-aligning the belt to a more comfortable position on her chest	area. Sue Stadnika, of Grand Rapids, affirmed that the Seatbelt	Adjusters were easy to put on and adjust. Joyce Olsen, also of Muskegon said "It's hard getting into a car and you find yourself with the seat belt up around your neck, and then it	works up into your face." She said that problem is now cured. Did you know that when a driver buckles up, children are buckled up 87 percent of the time. However, when a driver is unbuckled, children are restrained only 24% of the time. Seat belts reduce the risk of death for front seat occupants in passenger cars by 45 percent and the risk of moderate to critical injury by 50%. Click here to view recent TESTIMONIALS from our satisfied customers! 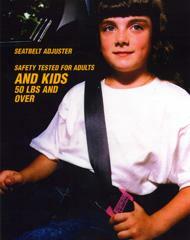 In 1999, motor vehicle occupant restraints saved the lives of approx. 11,197 people over age four. If all passenger vehicle occupants over age 4 used proper restraints, an additional 9,553 lives could have been saved in 1999. Reported from Buckle Up America May 2001.